Britain's prime minister David Cameron offered a set of proposals on Friday to discourage migrants from "benefit shopping" -- coming to the UK just to take advantage of the generous welfare benefits. His proposals are not targeted at Muslim migrants coming from Syria or northern Africa, entering the EU illegally. They're targeted at mostly Christian EU citizens in eastern Europe, for example in Bulgaria, where wages are typically 20% of those in the UK, or in Poland, with wages that are 40% of those in the UK. 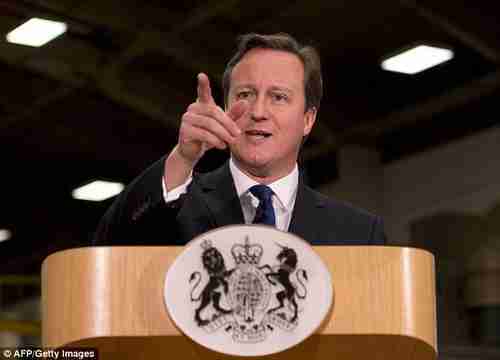 Cameron is under tremendous political pressure to find a way to limit east European migrants from coming to UK. The UK Independence Party (UKIP), which favors Britain leaving the EU entirely, is gaining strength because of the immigration issue, and the fact that EU immigration is reaching record levels. Previous proposals to simply put an annual cap or limit on the number of migrants have met with almost universal hostility from leaders across the EU, because they violate "guaranteed freedom of movement," which is one of the founding principles of the 1957 Treaty of Rome on which the EU is based. So now Cameron is trying something different: To limit migrants by making Britain's welfare benefits less attractive for migrants. No in-work tax credits (for people who work but receive too little to live on) or social housing until they've been in Britain for four years. No child benefits or tax credits paid for children living outside the UK. No unemployment support from the UK taxpayer, and deportation for a migrant who does not get a job for six months. Longer bans on "rough sleepers, beggars and fraudsters" returning to the UK. Significantly: Britain will veto new member countries from joining the EU, unless the EU agrees to limit migration from these countries until their economies have reached UK levels. Those who say we would certainly be better off outside the EU only ever tell you part of the story. Of course we would survive, there is no doubt about that. But we would need to weigh in the balance the loss of our instant access to the single market, and our right to take the decisions that regulate it. And we would of course lose the automatic right for the 1.3 million British citizens who today are living and working elsewhere in Europe to do so. That is something we would want to think carefully about giving up. If I succeed, I will, as I have said, campaign to keep this country in a reformed EU. If our concerns fall on deaf ears and we cannot put our relationship with the EU on a better footing, then of course I rule nothing out."